I first heard James Nestor on the podcast “Authors on Tour” (a great podcast, by the way) as he was giving an enthusiastic presentation at the Tattered Cover. I had a hunch I would dig Deep. I wasn’t disappointed. Deep is fascinating from first drop to last. The essential premise is this: there is still a mountain to learn about the ocean. “Two million years of human history, two thousand years of science experiments, a few hundred years of deep-sea adventuring, one hundred thousand marine biology graduate students, countless PBS specials, Shark Week, and still, still, we’ve explored only a fraction of the ocean,” Nestor writes. 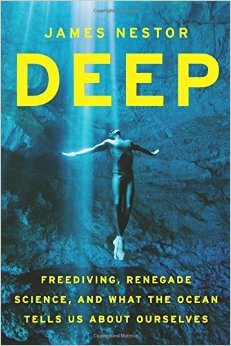 The idea for the book started with an article he wrote about freediving—and that peculiar sport weaves throughout Deep as a recurring issue. Nestor demonstrates how our understanding of what happens to the human body at depth has grown considerably in the past fifty years and he makes a convincing case that we are adaptable to deep water, even if the transformation during a solo freedive in the scary-deep (say, 300 feet) involves nitrogen narcosis, hallucinations and high risk of blacking out. The human body’s “Master Switch,” writes Nestor, knows how to manage a host of issues, most of them brought on by the tremendous pressure of all that water trying to crush your body. There’s ample evidence that key functions are prioritized even if it means your heart rate slows to seven beats per minute. Deep looks at the latest science with echolocation and “click” communication and Nestor makes a convincing case that dryland-conditioned humans have the ability, if we would only train ourselves, to develop an ability to “see” and “listen” in other ways than we normally think. Deep fully admits in its subtitle that the scientists being profiled are “renegades” but if they are outsiders or outside-the-box thinkers that’s fine with me—what’s wrong with passionate, zealous scientists on a quest? Ultimately, Deep is about our relationship with the ocean—how we are managing it, nurturing it, exploring it, understanding it, treating it. The answer to understanding ourselves, Nestor suggests, may lie in a full understanding of the oceans and the creatures that live there. Nestor’s case is convincing. This entry was posted in Books and tagged freediving, non-fiction, oceans, review, water, whales. Bookmark the permalink.